How do I customize the appearance of my calculators? What is the difference between a monthly or yearly subscriber and a lifetime subscriber of your calculators? What would help me choose between a monthly, yearly, or lifetime subscription? What expertise is required to add your calculators to my website? How are updated calculators automatically reflected on my website? You are charging my credit card each month or year. That means you must be storing my credit card account number somewhere. How is that secure? What do you mean by a calculator group? When I subscribe to a group, what exactly do I get? What Windows and Macintosh browsers have your calculators been tested with? 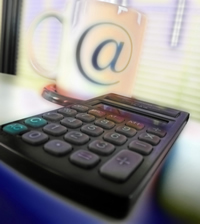 Do I need a Java plugin to run your calculators? Will my customers need to have cookies enabled to use your calculators from my website? How can I turn off the image toolbar that pops up in the upper left corner when I move my cursor over certain images (like the calculator images in the Catalog)? I can't find the instructions and examples that were emailed to me. How can I get you to email those again? The customized values I need to use have special characters that are not interpreted properly by the browser. How can I use customized values with these special characters? Using parameters and values in a cascading style sheet (.CSS file), you can change each individual calculator and assessment's default graphic (maybe you want to use your logo or another image), colors, and/or fonts. We also allow you to turn off the field help, custom set the initial field values or have the field values be blank when a calculator runs. The easiest way to customize you calculator or assessment is to go to our Examples page, select your calculator or assessment from the dropdown list (hint: you may need to check the 'Include All Calculators' box if your doesn't show in the short list), find the section showing the example of your customizations, copy the link text in blue below that section header into your web code to get the formatting, then change the parameter values or the	values in your .CSS file to get the look you want. A monthly or yearly subscriber is paying month-to-month or yearly for a license to use some of the calculators from our website. Lifetime subscribers have paid a one-time subscription fee and use the calculators as long as they wish. As a subscriber you simply drop a link to our calculators, running from our web page, into your web page. Many calculator attributes can be customized by subscribers, including company or website name, logo or image, colors, and fonts so they can take on the look of your website design. All updates to our calculators automatically will be reflected on your website without you having to do anything else. When calculators are added to any of your subscription groups, you will receive an email with the links you need to add to your webapge. Simply add those link and your new calculators are up and running. We send the links for all calculators in your subscription group(s), but you always choose which calculators you want to include. It is more cost effective to subscribe monthly or yearly if you don't anticipate running your website for 3 or more years. You should also consider a lifetime subscription if you don't want to pay subscription charges each month or year. If you are a subscriber, all calculators actually run from our website. All you do is include a link to the calculator in your web page. (Examples) Every time a request to run a calculator is made from your website, the latest version of that calculator will be run. After you login, you will see a 'Subscriptions' tab across the top. Go to that 'Subscriptions' page to see all the calculators you currently subscribe to. Check the 'Unsubscribe' check box for each calculator or group you want stopped, then click 'Update'. Your subscription will be terminated, your credit card will no longer be charged and any refund (for yearly subscriptions) will be issued. Our products page shows all the calculator and assessment groups we currently offer. A certain industry may have interest in all the calculators or assessments in a group. If you subscribe to a group of calculators or assessments you will have license to use all the individual calculators or assessments included in that group. Windows IE 6.0 All calculators were designed to work with this browser. Windows Netscape 8.1 For best results, set us as a trusted site and set the browser to pop-up separate windows instead of just opening new tabs. Windows Firefox 1.5.0.4 Everything seems to work as designed. Windows Opera 9.00 Everything worked great with 8.0. There are a few quirky things with 9.00, mostly with how some things look, that don't seem to have a straightforward fix. Hopefully, they'll fix some bugs soon and things will work a little better. Macintosh Safari 1.2.2 Everything seems to work as designed. The window title in many of the popup windows (i.e. Print Ready and Formula windows) says "Untitled", but the name or description is included in the window text so you can still tell what you're looking at. Macintosh Netscape 7.1 Everything seems to work as designed. Macintosh Firefox 1.0.4 Everything seems to work as designed. Macintosh Opera 8.0.1 The printer icon in the Print Ready and Formula windows doesn't bring up the print dialogue. You need to click 'File' then 'Print' (the same way you print any window) instead of clicking the print icon. No. Cookies are used by web sites to store information on the web user's local computer. They may be used to store values for future visits to the site. We do not store anything on the user's computer, so cookies are not required. This is a feature of Internet Explorer that can be turned off (it only pops up for images 200 x 200 pixels or larger). To turn it off, move your cursor into the image toolbar area and right click, then choose the Disable Image Toolbar option. You can then choose to turn it off just for this browser session or permanently. (All of the options offered in the image toolbar can be activated by right clicking anywhere in the image area, then selecting that option). Just log in so you get the 'Subscriptions' tab across the top. Click that to go to the 'Subscriptions' page. Under the title 'Subscriptions', near the top, click the link that says 'Resend the instructions and examples for my calculators.' The instructions will be immediately emailed to the email address set up for the account. (Change email address.) Please note that for purchased calculators, we will only automatically resend scripts and instructions up to 30 days from the purchase date. If you have purchased calculators and need the scripts resent after 30 days from purchase, please to see if we currently have scripts for your calculators' revisions.